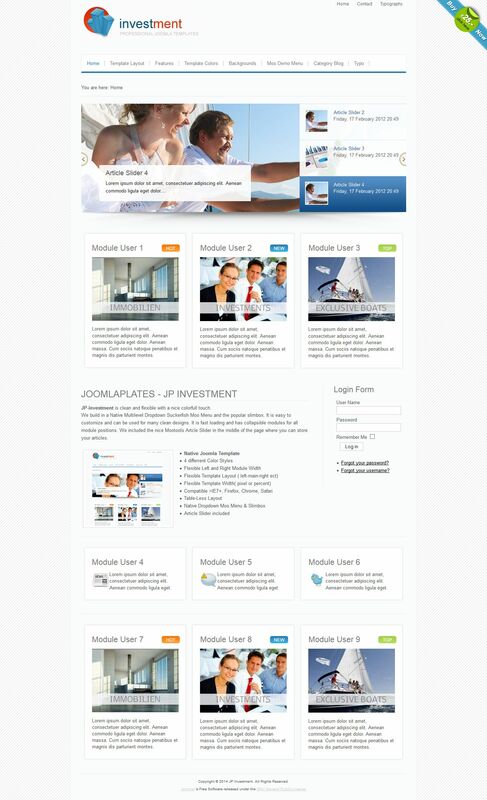 JP Investment - simple business template from renowned developers Joomlaplates, supports all versions of Joomla, ideal for creating official websites of business entities (firms, companies, etc.). This template has Suckerfish drop-down menu with the option to add multiple levels. In addition, the template includes a slider Artcle Mootools, which provides a stylish site content. Flexible control panel allow you to edit everything visible elements. You can customize the types of speaker positions, background image, background color, choose one of the three color styles, width sidebars, activate the built in tools SlimBox.